To see if a structure has sufficient fatigue life, tests and/or analysis must be done. The outcome of the tests and/or analysis leads to conclusions, such as the structure can have inifinite of finite life. If the fatigue life is finite it must be considered what to do when this life is reached. Think of replacement of (a part of) the structure or monitoring crack growth. The finite life resulting from test or analysis is usually a lower bound. It often pays off to keep using the structure after this lower bound and monitor the actual condition of the structure by inspections. That means that a maintenance schedule is required. For fatigue that implies that both threshold inspection (first inspection) and inspection interval are determined. The inspection threshold, so the earliest moment crack initiation is to be expected, is usually determined with SN curves. 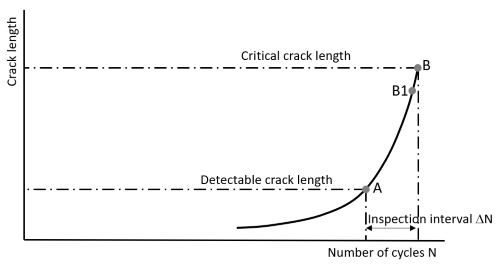 Inspection intervals, the period between detectable and critical crack sizes (points A and B in the figure below) are determined using crack growth calculations. It often makes sense to keep the inspection interval a little shorter (A to B1) to allow for repairs etc. This is a fairly simple approach, Yet it often goes wrong. To save money, managers (without any knowledge on this topic) tend to think that intervals can be stretched or even ignored. Or, if any fatigue damage is present, insufficient effort is made on replacement or repair. There are some sad examples, like the railway accident at Hatfield (october 2000, killing 4 persons, over 70 injuries) and the Alaska Airlines flight 261 crash (January 2000, killing 88 persons). Another issue is ongoing checks on boundary conditions. This was lacking with the Merwede bridge in The Netherlands. The fatigue damage in the bridge wasn’t found because of the good inspection schedule (actually there wasn’t a schedule at all) but because an increased traffic capacity (widening the bridge) was considered. Only because of this consideration the condition of the bridge was checked to see if increased traffic capacity was feasible. There indeed are loading standards for bridges that consider traffic growth, it is however seldom checked if the actual traffic growth agrees with expectations. In short, determination of an inspection schedule is one aspect, doing something sensible with it is at least as important. Fatec Engineering can help you. Fatigue in the Merwede bridge.